The Inbound property determines whether inbound Architect call flows can select this script. Click the Inbound property group. 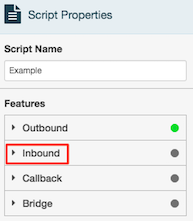 Enabling the Inbound property for a script allows Architect call flows to select it. Any call flow can invoke the script to screen pop an interaction. However, if an Architect call flow needs to pass information to the script, variables in the script must have the same name and data type as variables in the call flow. When Architect passes control to the script, the values of variables in the call flow are assigned to corresponding script variables. The assignment happens before screen pops occurs. Setting this up requires the script designer and the flow author to exchange information about the variables.